Pictured L-R: Mike Metheny, Angela Holmes, Isaiah Carter, Tristan Brown, Russ Berlin. 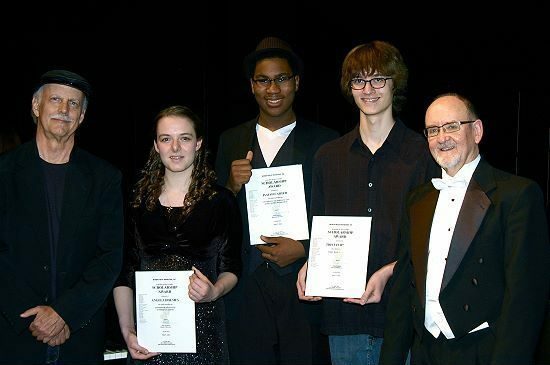 As part of the May 5 spring concert by the Lee’s Summit Symphony Orchestra at the Bernard C. Campbell Performing Arts Center in Lee’s Summit, MO, the Metheny Music Foundation’s annual summer music studies scholarships were awarded by Foundation board member and chairman, Mike Metheny. The Symphony’s music director, Russell E. Berlin, is also a Metheny Music Foundation board member and serves on its Scholarship Committee. Tristan Brown, a bassist, who will be attending the UMKC Bass Workshop in July. Isaiah Carter, a drummer and keyboard player, who will be attending the Jazz Combo Workshop at the University of North Texas (Denton) in July. Angela Holmes, a cellist, who will be attending the Innsbrook Institute Summer Music Academy (near St. Louis) in June.